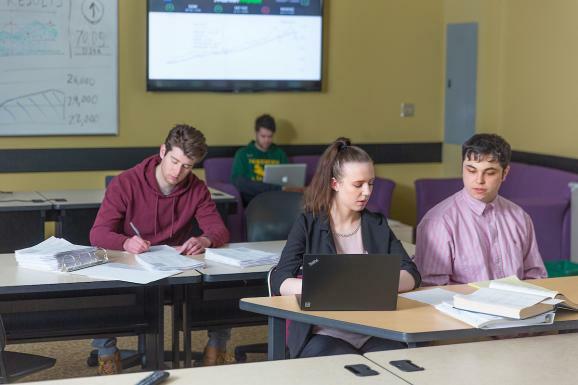 Northern Michigan University has increased the number of credit hours students can transfer from regionally accredited community colleges from 64 to 90. The recently approved policy change will go into effect this fall. It recognizes the value of students’ past academic work at other institutions and aligns with the statewide initiative to create better transfer pathways that maximize the use of credits earned. Many community colleges have expanded the scope and depth of their program offerings through partnerships with universities. When the previous policy was in place, several NMU academic departments developed or were planning to develop articulation agreements that allowed up to 90 transfer credits instead of 64. Rather than restrict the benefit to specific majors, the policy change enables NMU to apply it equitably to all transfer students. The across-the-board increase will also improve efficiency. For students who exceeded the former 64-credit limit, NMU reviewed their records to select the courses most applicable to the students’ degree requirements. The process was repeated if students changed their majors. Rotundo said the 90-credit limit prevents the need to pick and choose which completed courses NMU will accept. On a related note, the university no longer requires that at least 20 of a student’s final 30 credits be completed at NMU. For transfer student information, visit nmu.edu/transfer.